While the Los Angeles Lakers were preparing to chase LeBron James in free agency, many doubted he would sign prior to them first luring another All-Star. Upon James quickly agreeing to a four-year contract, there was an expectation the Lakers would pursue a second marquee player. With James lending his support to the Lakers young core and the franchise’s vision of a two-year window to make a splash in free agency, they instead stood pat. Now the question becomes whether the Lakers will look to improve this season’s team without sacrificing salary cap space. 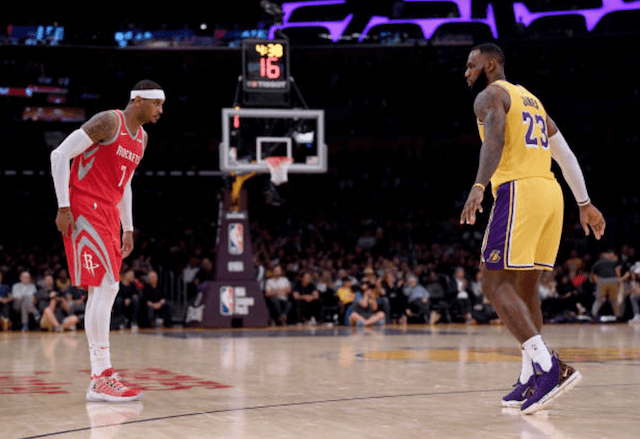 Once Carmelo Anthony and the Houston Rockets agreed to seek a separation, speculation ran rampant that James would look to play with his close friend. When asked about the possibility, James deflected the question to the Lakers front office. 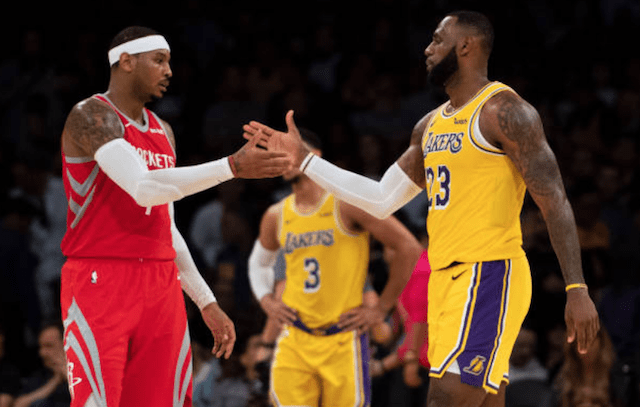 LeBron​ James would​ like to get Carmelo​ Anthony to Los​ Angeles​ with him​ on​ the Lakers,​ a league​ source​ told​​ The Athletic. After a failed season with the Oklahoma City Thunder, Anthony was traded to the Atlanta Hawks and immediately bought out of his contract. He went on to sign a one-year deal with the Rockets, joining forces with Chris Paul, another of James’ close friends, and James Harden. Like most suspected, the pairing didn’t pan out, lending to a decision between Anthony and the Rockets to find a solution. Anthony’s style of play on offense and decline on defense doesn’t mesh with the Lakers’ approach, but time will tell if that’s enough to dissuade James.